The Dark Side of the Moon. LROC WAC orthographic projection centered at 180° longitude, 0° latitude. Image Source: NASA/Goddard/Arizona State University. 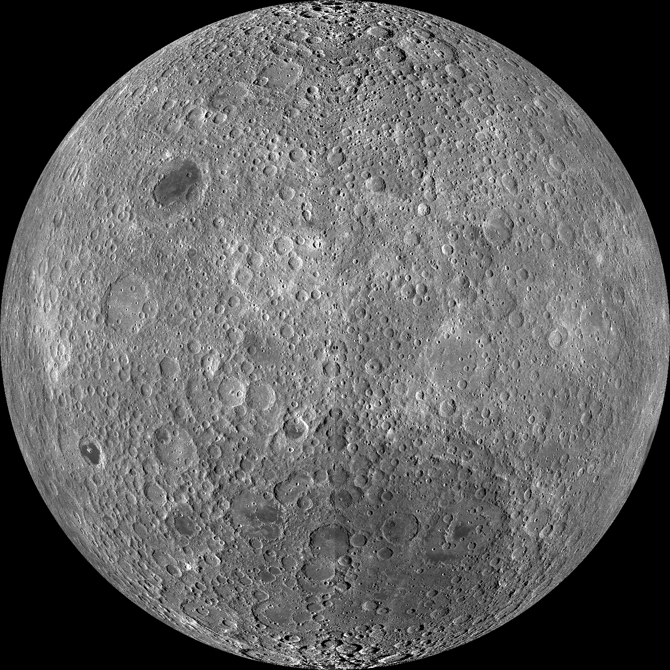 Caption for the above photograph: Because the moon is tidally locked (meaning the same side always faces Earth), it was not until 1959 that the farside was first imaged by the Soviet Luna 3 spacecraft (hence the Russian names for prominent farside features, such as Mare Moscoviense). And what a surprise -­ unlike the widespread maria on the nearside, basaltic volcanism was restricted to a relatively few, smaller regions on the farside, and the battered highlands crust dominated. A different world from what we saw from Earth. As the temperature begins to warm and the ground begins to thaw, earthworm casts appear, heralding the return of the robins. The more northern tribes knew this Moon as the Full Crow Moon, when the cawing of crows signaled the end of winter; or the Full Crust Moon, because the snow cover becomes crusted from thawing by day and freezing at night. The Full Sap Moon, marking the time of tapping maple trees, is another variation. To the settlers, it was also known as the Lenten Moon, and was considered to be the last full Moon of winter. A few days ago, in the wake of the huge Japanese earthquake, a commentator on CNN remarked that the proximity of the Moon to the Earth can affect tsunamis and earthquakes. Image Source: Fallout via Nawi Derahman. Fasten your seatbelts. Brace for impact. This is only the beginning. The Japanese earthquake struck just over a week ago. 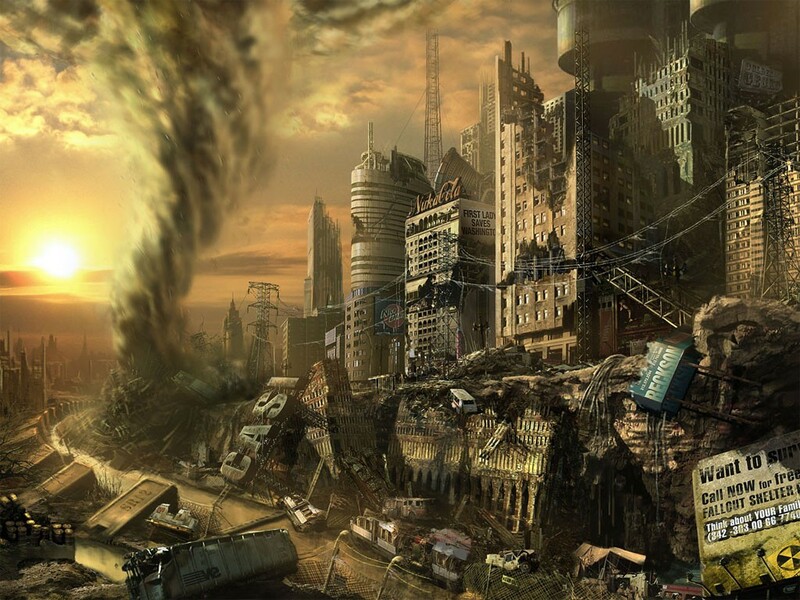 In scanning the blogs and tweets for the general mood, I find a shrill apocalyptic consensus rising online. On early March 18, Vinay Gupta (@leashless on Twitter) tweeted: "The air stinks of war if you can feel it, the acrid edge of blood and smoke. You can't have revolutions in the middle east without the risk. And we're all tottering on the edge of a global financial collapse, which the oil price spike / crippled Japan combo may trigger." Among reports on the earthquake, tsunami, nuclear plants and radiation, devastation of coastal towns, tales of survivors and mass death, news is surfacing about Japan's lost pets that have survived the disaster. As if on time delay, the world's concern for Japan deepened as pictures of stranded animals made the rounds on the Web today. Nippon SPCA is here. Japan Earthquake Animal Rescue and Support (a coalition of three groups — HEART-Tokushima, Animal Garden Niigata, and Japan Cat Network) is here. 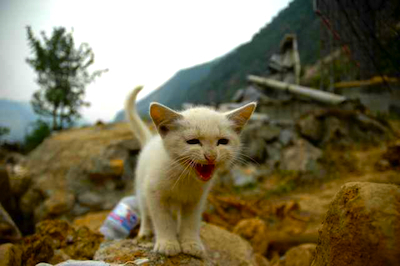 In addition, there are some reports circulating about animals' sensitivity to these terrible events - with some pointing to the superstition that animals respond to coming earthquakes before we anticipate them (as with my post here). In both cases, our perceptions of animals mirror our anxiety and emotions surrounding this intensifying crisis. 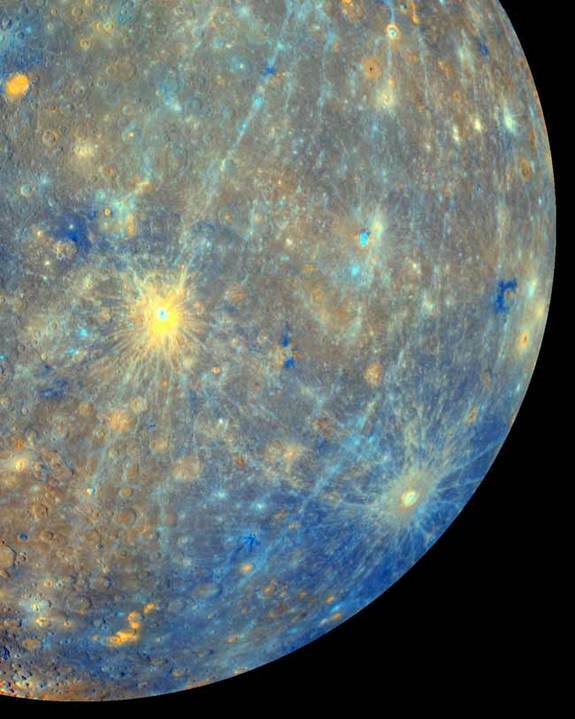 A false colour image of Mercury, captured by Messenger, using several filters (6 October 2008). Image Credit: NASA/Johns Hopkins University Applied Physics Laboratory/Arizona State University/Carnegie Institute of Washington. Image Source: Space.com. For weeks now, space-exploration-related Websites have been anticipating the entry of NASA's Messenger craft into Mercury's Orbit today. The craft has a heat shield made of ceramic cloth to shield Messenger from temperature extremes as high as 425 degrees Celcius and -185 degrees Celcius. The cloth keeps the instruments consistently at room temperature. It has taken more than six years for Messenger to travel to Mercury and line it up so that it enters the planet's orbit. On receipt of ... early images of Mercury, Prockter writes: "How often in your life do you get to see something completely unexplored?...My first feeling was one of complete joy and disbelief – a perfect, beautiful, gibbous Mercury filled the screen, showing an incredible level of detail." This mission will bring unprecedented photographs of the planet, which is slightly larger than our Moon, to public attention over the coming months. Large Hadron Collider also a Time Machine? 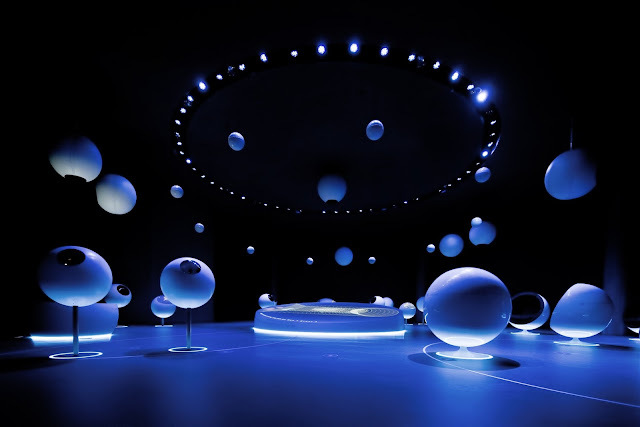 Inside the Globe of Science and Innovation at CERN. Image Source: CERN via Physics World. If the latest theory of Tom Weiler and Chui Man Ho is right, the Large Hadron Collider – the world's largest atom smasher that started regular operation last year – could be the first machine capable causing matter to travel backwards in time. "Our theory is a long shot," admitted Weiler, who is a physics professor at Vanderbilt University, "but it doesn't violate any laws of physics or experimental constraints." According to Weiler and Ho's theory, these singlets should have the ability to jump into an extra, fifth dimension where they can move either forward or backward in time and reappear in the future or past. "One of the attractive things about this approach to time travel is that it avoids all the big paradoxes," Weiler said. "Because time travel is limited to these special particles, it is not possible for a man to travel back in time and murder one of his parents before he himself is born, for example. However, if scientists could control the production of Higgs singlets, they might be able to send messages to the past or future." Image: Ward Shelley. Image Source: Boing Boing. 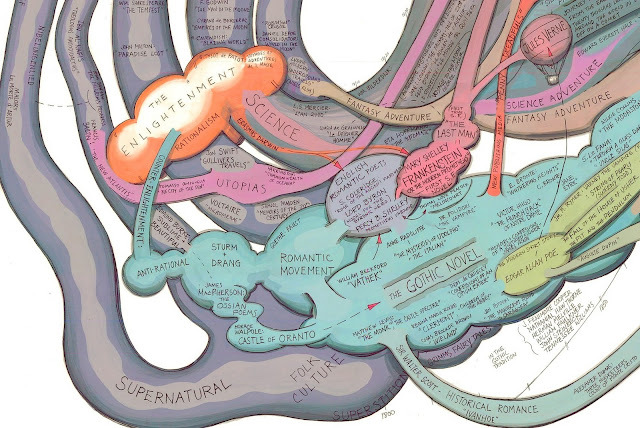 A few days ago, Boing Boing ran a piece about a great graphic depiction of the history of Science Fiction by artist Ward Shelley (Hat tip: Boing Boing via Lee Hamilton). The history is symbolically presented as a series of interconnected organs, as in a medical diagram of a body. The section above is the one that interests me the most, and is relevant for understanding the origins of ideas that are floating around at our turn of the Millennium. I sense that the great conflict between Rationalism and Anti-Rationalism, embodied respectively in the Enlightenment (as in: Science) and in Romanticism (as in: Fiction) is now reaching a point where the two have reconverged almost completely. After two hundred years of wars, revolutions, genocides, as well as political, social, industrial and technological revolutions, the West's Yin and Yang are combining to form a mashed-up shade of gray. Truth has become fiction and fiction has become truth. Reality has become unreal and vice versa. Shelley's whole image is below the jump; you can click on it to see it close up. Gamma ray burst from an exploding star. Image Source: ESA, Stephen Holland (Danish Centre for Astrophysics with the HST), Jens Hjorth, Johan Fynbo (University of Copenhagen) via Daily Galaxy. Caption for the above phorograph: The image ... is an enlargement of a combined image obtained with the Space Telescope Imaging Spectrograph (STIS) onboard the NASA/ESA Hubble Space Telescope through a clear filter (shown in blue) and a red filter (shown in red). The region shows the star-formation taking place around the gamma-ray burst region in the galaxy ESO 184-G82. In this new image from the Hubble Space Telescope, you'll see a spectacular gamma ray burst and supernova as a bright point in the irregular galaxy located approximately 820 million light years from the Earth. An international team of researchers made the discovery using NASA's Swift satellite. "Only about one out of 10,000 supernovae produce gamma ray bursts, and gamma ray bursts in the relatively near universe are even more rare, so it gives us a unique opportunity to study the phenomena in detail. When you have one that is so near, it is like a clock telling you that the star is dying just NOW, and you can follow the early phases and the entire development of the supernova explosion that follows", explained Johan Fynbo. It is only the very large, massive stars of more than 30-40 solar masses that produce gamma ray bursts. What happens is that when the star dies, it collapses and forms a black hole. If the black hole spins very quickly, a jet might appear - a gamma ray burst, which is powerful, high-energy radiation, which shoots out at nearly the speed of light. It happens very quickly and only lasts a few seconds. Image Source: Corning via Waylou. Can you imagine organizing your daily schedule with a few touches on your bathroom mirror? Chatting with far-away relatives through interactive video on your kitchen counter? Reading a classic novel on a whisper-thin piece of flexible glass? 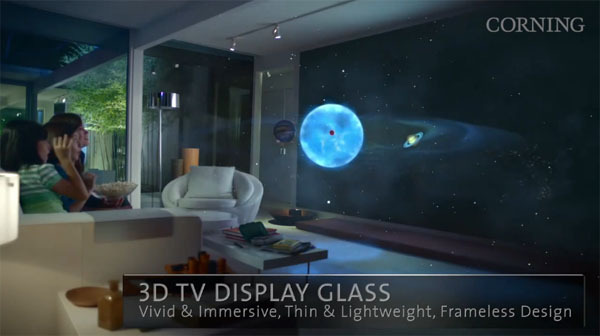 Does the world showcased in “A Day Made of Glass” seem like something out of a fantasy movie? Jim Clappin, president of Corning Glass Technologies, reminds us that, just a decade ago, pay phones, VCRs, and film cameras were also commonplace. Today, we’re accustomed to movies streaming on demand to a 60-inch television hanging on the wall and to video calls on notebook computers, essentially for free. See the video and popular reactions to it below the jump. The reactions remind me of one of my earlier posts, in which I talked about an unanticipated anti-tech backlash in the future.